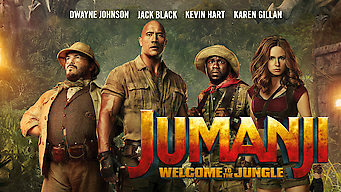 How to watch Jumanji: Welcome to the Jungle (2017) on Netflix Australia! Sorry, Jumanji: Welcome to the Jungle is not available on Australian Netflix, but you can unlock it right now in Australia and start watching! With a few simple steps you can change your Netflix region to a country like Hong Kong and start watching Hong Kongese Netflix, which includes Jumanji: Welcome to the Jungle. We'll keep checking Netflix Australia for Jumanji: Welcome to the Jungle, and this page will be updated with any changes. Jumanji: Welcome to the Jungle is not available in Australia BUT it can be unlocked and viewed! Four high school students get sucked into the jungle setting of a video game, where they embark on a quest as their comically mismatched adult avatars. They're teens. Trapped in a game. And stuck in grown-up bodies. Turns out detention wasn't the worst part of their day. There is a way to watch Jumanji: Welcome to the Jungle in Australia, even though it isn't currently available on Netflix locally. What you need is a system that lets you change your Netflix country. With a few simple steps you can be watching Jumanji: Welcome to the Jungle and thousands of other titles!